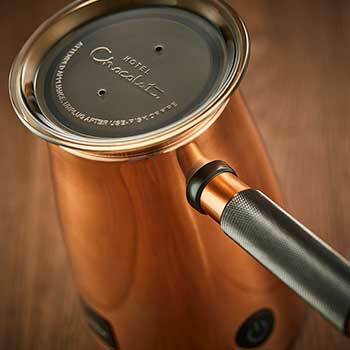 The superlative gift hamper for chocolate devotees. No two ways about it: they’re lucky to have you. Don’t be shy. Show them just how much you care with the biggest year-round gift hamper we do. 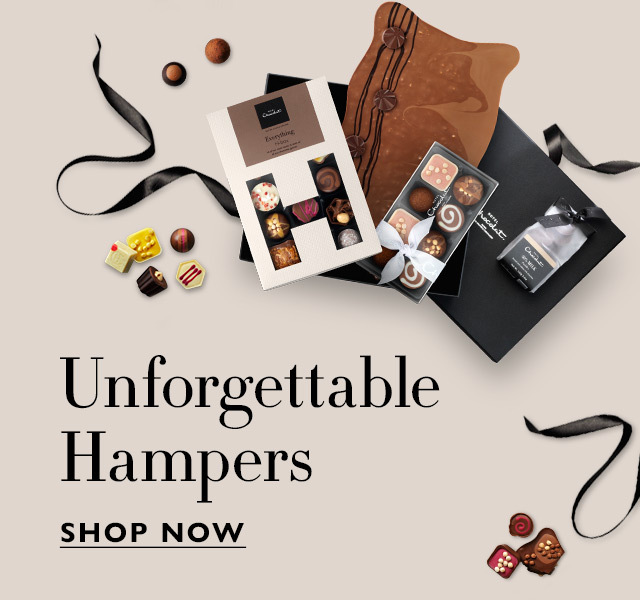 Shower them with top-tier Venetian bubbles, a keepsake tin of biscuits, creamy yet deep hot chocolate and, of course, more chic bags and boxes of chocolates than one person could reasonably need, presented in our sizeable, sophisticated ribbon-tied gift hamper. They’ll think of you with everything they open for weeks to come. Ingredients: cocoa solids (cocoa butter, cocoa mass), sugar, full cream MILK powder, shortbread biscuits (wheat flour (WHEAT flour, calcium, iron, niacin, thiamin), butter (from MILK), sugar), cocoa nib and hazelnut shortbread (wheat flour (WHEAT flour, calcium, iron, niacin, thiamin), butter (from MILK), sugar, cocoa nibs, HAZELNUT nibs, cocoa powder), stabilisers (sorbitol, glycerol), skimmed MILK powder, HAZELNUT paste, sweetened hazelnut paste (HAZELNUTS, sugar, emulsifier (sunflower lecithin)), whipping cream (cream (from MILK), stabiliser (carrageenan)), butter oil (from MILK), icing sugar, PECAN NUT paste, caramel (glucose fructose syrup, sweetened condensed MILK, half salted butter (from MILK), sugar, salt, emulsifier (SOYA lecithin), water), glucose syrup, vegetable oils (palm, rapeseed), dark cocoa biscuits (wheat flour (WHEAT flour, calcium, iron, niacin, thiamin), sugar, vegetable oils (palm, rapeseed), cocoa powder, malt blend (glucose syrup, BARLEY syrup, malt extract (from BARLEY)), raising agents (sodium bicarbonate, tartaric acid), salt, flavouring), sticky toffee sauce (sugar, cream (from MILK), butter (from MILK), flavourings), caramelised sugar (sugar, glucose syrup), emulsifiers (SOYA lecithin, sunflower lecithin), neutral alcohol, florentines (ALMOND NUTS, sugar, butter (from MILK), glucose syrup, honey, cream (from MILK), HAZELNUTS), caramelised sugar, invert sugar syrup, cocoa biscuits (wheat flour (WHEAT flour, calcium, iron, niacin, thiamin), sugar, vegetable oils (palm, rapeseed), cocoa powder, malt blend (glucose syrup, BARLEY syrup, malt extract (from BARLEY)), skimmed MILK powder, raising agents (sodium bicarbonate, tartaric acid), salt, flavouring), pistachio paste (PISTACHIO NUTS, rapeseed oil), PEANUT paste, shortcake biscuits (wheat flour (WHEAT flour, calcium, iron, niacin, thiamin), non-hydrogenated vegetable fat (palm, shea, rapeseed), sugar, invert sugar syrup, tapioca starch, salt, raising agents (sodium bicarbonate, ammonium bicarbonate), emulsifier (sunflower lecithin)), feuilletine (sugar, WHEAT flour, butter oil (from MILK), MILK protein, MILK sugar, malt extract (from BARLEY), raising agent (sodium bicarbonate), salt), fruit juice concentrates (carrot, strawberry, rhubarb, apple, raspberry), freeze dried strawberry powder, walnut paste (WALNUTS, sunflower oil, citrus fibre, emulsifier (SOYA lecithin)), champagne (SULPHITES), caramel half-salted butter (glucose fructose syrup, sweetened condensed MILK, half salted butter (from MILK), sugar, water, salt), MILK fat, nibbed PECAN NUTS, HAZELNUTS, sunflower oil, whole MILK powder, flavourings, desiccated coconut, whole MILK, candied orange peel (orange peel, dextrose, glucose syrup, sugar), dextrose, ALMOND NUTS paste, organic cocoa powder, yoghurt powder (from MILK), lemon concentrate (lemon, acidity regulator (citric acid), lemon essential oil), sea salt, cinnamon paste (glucose syrup, cinnamon, water, plain caramel, essential oil (cinnamon)), natural colours (paprika, carotene, beetroot, annatto), coffee paste (coffee paste, refined sunflower oil, flavouring, fruit extract, glycerin), cereals coated with chocolate (crisped rice (rice flour, sugar, cocoa butter, salt), sugar, cocoa mass, cocoa butter, whole MILK powder, whey powder (from MILK), butter oil (from MILK), vegetable fat (coconut), glazing agents (gum arabic), glucose syrup, modified starch (potato, maize), emulsifier (SOYA lecithin), flavouring, spices), acidity regulator (citric acid), ground cinnamon, amaretti biscuits (sugar, WHEAT flour, apricot kernels, EGG white, raising agents (sodium bicarbonate, ammonium bicarbonate)), freeze dried raspberry powder, salt, freeze dried raspberry pieces, ground nutmeg, vanilla seeds, essential oils (orange, lemon), acidity regulators (malic acid, citric acid), concentrate of spirulina.